Fall hits and I cannot resist buying far too many pumpkins. Pumpkin carving is one of the most exciting parts of Halloween. That said, I’m not about to hand my kids their own knives and let them have at ‘er. Having toddlers seems to be the mother of invention. 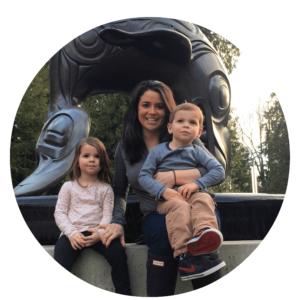 Anything that keeps them preoccupied, allows them to try new skill-sets, and is safe makes for one very happy mama. Here are several super simple mini pumpkin crafts we have done (and loved). Paint or draw on your mini pumpkins tempera paint, chalk markers, or washable markers. What I love about this is that we can get multiple uses out of a couple of mini pumpkins. They’re blown away by whatever they’ve drawn and like seeing how different colours show up on orange or white skinned pumpkins. All of these options are washable, so we get multiple uses out of our pumpkins! This idea is thanks to Sue Parke. 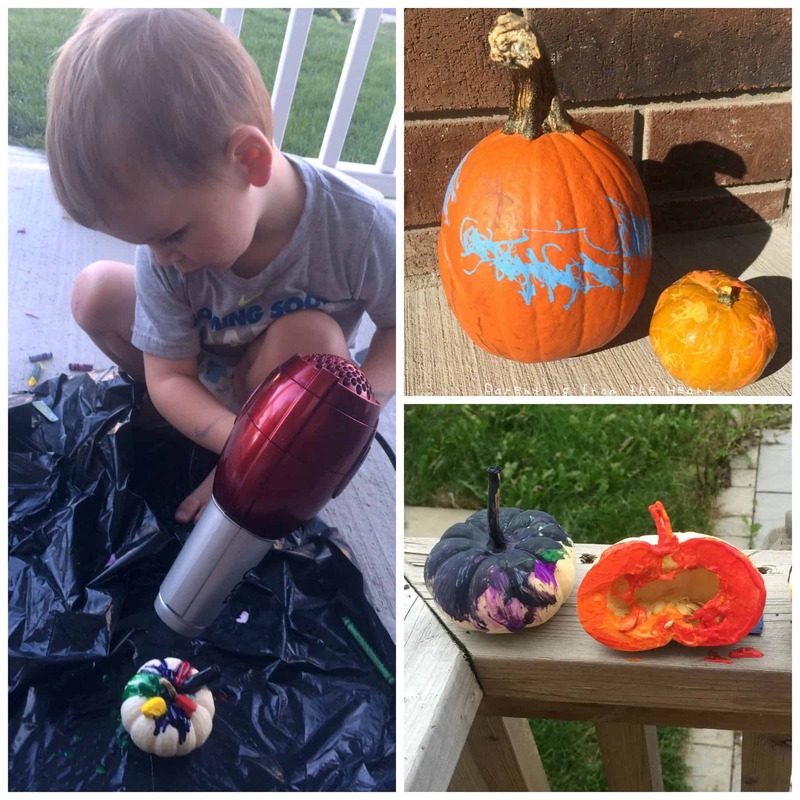 She recommends painting mini pumpkins (or the regular variety) with chalk paint and handing your little one some chalk. She uses this activity while trying to prep dinner for Thanksgiving and finds it buys her a lot of quiet time! Cut one mini pumpkin in half length-wise, puncture the middle of the back of each with salad forks (these act as handles). Pour about three tbs. of paint onto a side plate, and let them stamp away. I like to use poster board or parchment paper when doing this craft as either can cover a larger surface area than just paper. If using parchment paper, you can later tape it to your window to create a stain glass effect (stain glass idea is from Happy Hooligans). I bought jack-o-lantern decals at the dollar store for another craft and used those first. I also bought a package of small Halloween stickers and let my kids cover mini pumpkins. Even if you don’t have Halloween stickers, any small stickers work well. Plus, I promise you, this will buy you A LOT of quiet time. I’ve used toilet paper for bigger pumpkins, but white streamers or paper towel cut into 1/2-inch strips tend to work best. Do not set your mummies outside unless the forecast is for dry weather or it’s Halloween night (moisture means the paper will eventually fall off). Give your kids some tape, strips of paper towel, and let them have at ‘er! After they’re done mummifying their pumpkins, with Elmer’s glue or a glue gun, affix eyes on to the skin of the pumpkin. Grab a garbage bag, broken crayons, a glue gun, and a hair dryer. First, place a garbage bag down on the surface you will be working on. You want this so the melted crayons don’t ruin your patio, kitchen table or floor. Then, peel broken crayons. Using a glue gun secure broken crayon pieces to the mini pumpkin. Your crayon pieces should be about 1/2 inch long. The glue gun is necessary so that the crayons do not blow away. Turn on your hair dryer and point it directly above the crayons. It will take about 3 – 5 minutes for the crayons to completely melt, dripping down the crevices of the pumpkin. Want more FUN ideas like this? Click the banner below. So many fun and SAFE ideas! Thanks you for sharing! The most my daughter has done is draw on a pumpkin with a sharpie. I’m sure she would love something a bit more colorful! Love all of these ideas!! The pumpkin stamping idea would make a really cool table runner for thanksgiving! Maybe on burlap?? Oh that sounds SO cool!!! The mummy pumpkin is my favorite. I love it. These are great ideas! Perfect for my preschooler to try! I LOVE the melted crayons idea! And stamping…cute! pinning and stumbling! So very cute! We never get pumpkins and I wish we did because I love them. The mini ones are just too adorable. I love all these ideas. Especially the mummy and the crayon one. Halloween is not the same without awesome pumpkins. I need to get on it and try to get some before it’s too late. Thanks so much for reading, Rebecca! So much fun! I love how the crayon melted ones look, so maybe I’ll be brave enough to try it. I also love how you cut the one in half and did stamps. Such great ideas! Great ideas! LOVE the mummy pumpkin haha! In our house there is no need to GIVE Hazel a knife, she will just go get one herself! They really should hand out bottles of wine to parents as they leave the hospital! We have a painted pumpkin in our living room right now. We tried Apple Stamping, that was chaotic but I think we need to try the crayon one, I mean what else am I going to do with all the Whitespot Crayons in my purse? Such fun ideas. I think I’m letting the girls do stickers on their little pumpkins tomorrow. Thanks for sharing!!! I am loving all your pumpkin crafts. My favorite is the mummy pumpkin, it’s so creative! Thanks so much, Shelah! We love doing all sorts of activities with mini pumpkins!